Sweet Yeast Rolls with Whipped Pumpkin Butter – The fluffiest yeast rolls you’ve ever had with a hint of sweetness and served with homemade whipped pumpkin butter, perfect for Thanksgiving, Christmas, and all your holiday dinners. Bread. My first true love. Is there anything better than bread fresh from the oven? Super chewy and fluffy at the same time. I’ve always had a weakness for bread. Oh the horror stories I could tell about my BRIEF attempt a carb-free diet. It did not go well. But let’s focus on a happy memory about my love affair with bread, shall we?? All of this is to explain that bread is very important to me and has always has been. So whenever you see me post about a bread recipe or recommend a bread from somewhere, you can trust that I know what I’m talking about. So that brings me to today’s recipe: Sweet Yeast Rolls with Whipped Pumpkin Butter. The inspiration for this post actually began with the whipped pumpkin butter, believe it or not. I’ve been making it for Thanksgiving for a few years now. It’s one of my nephews favorite things so he always requests I make it. I mean, butter, pumpkin, cinnamon, and honey all whipped together – can you blame him for loving it?? I planned on sharing it with you guys. But I also wanted to share some killer dinner rolls to go with it. What’s butter if not to spread it on a bread vessel?? When choosing the the perfect rolls, they needed to be nice and fluffy and, of course, chewy. But I also wanted them to be pretty easy to make. I found this incredible recipe from The Food Charlatan. I loved that I had all the ingredients on hand and that the rise time wasn’t crazy long. Plus, they looked sooooo fluffy! And man, were they ever! Not only were they fluffy, but so incredibly chewy. My husband even said they were the best rolls he’s ever had. And trust me – he’s not just saying that. These rolls are so full of flavor with a slightly sweet finish. They’re not as sweet as Hawaiian rolls – its more subtle than that. This makes them the perfect bread to serve with the whipped pumpkin butter. This recipe (and many bread/roll recipes) calls for scalded milk. This means milk that is heated just before it begins to simmer/boil. The heat kills the whey protein in milk, which helps the dough rise higher. This is key to getting that chewy consistency. So don’t skip this step! When working with active dry yeast, you need to activate it with warm water. But it cannot be hot water or else the yeast will die. You’ll know if it died because you won’t see any foam in the yeast after 5 minutes. It will just look like cloudy water. I like to use tepid water from the sink faucet and it’s never failed me. I only use my stand mixer to help the dough come together. Once the dough forms, I dump it onto the counter and knead by hand. So don’t fret if you don’t have a stand mixer – this is super easy to do by hand, too! The rolls need to be touching before you bake them. This makes sure they’re super soft. If you bake them on a sheet, they’ll get too crunchy on the outside. So make sure you use a 9 x 13 rectangular pan. You can easily freeze any leftover rolls. Just place them into a freezer-safe storage bag/container. They keep for a couple months. Whenever you crave a roll, pop it in the microwave for 30 seconds and it’s warm and fluffy again! When making the pumpkin butter, it’s so important that you follow the instructions and add the pumpkin very slowly. Pumpkin puree has a lot of moisture so if added to quickly, the butter will never fluff up. These sweet yeast rolls have become such a favorite of mine that I’ll be enjoying these every Thanksgiving along with the whipped pumpkin butter. I hope you’ll try them out and make them part of your tradition too! The fluffiest yeast rolls you've ever had with a hint of sweetness and served with homemade whipped pumpkin butter, perfect for Thanksgiving, Christmas, and all your holiday dinners. Add warm water (not too hot!! ), yeast, and 1 teaspoon of sugar to a large mixing bowl fit for a stand mixer and gently stir together. Let sit for 5 minutes. Yeast should begin to activate and form a layer of foam on top of the water. While yeast is activating, add milk and 2 tablespoons of unsalted butter to a small sauce pan and scald over medium heat. Scald means to heat right before a simmer. You should see small bubbles form around the edges of the pan. Remove from heat. Once yeast has activated, add 2 1/2 tablespoons of sugar, 1 teaspoon salt, 1 cup of flour, and egg to the mixture. Stir to combine. Slowly pour in warm milk while stirring into the batter until combined. Let mixture sit for 5 minutes to rest. Attach bowl to stand mixer and fit mixer with dough hook (you can mix by hand, if you don't have a mixer). Add 1 cup of flour and mix on low to combine. Add another cup and mix to combine. If the dough is still sticking to the edges of the bowl, add 1/2 cup flour. Keep adding if it's still getting stuck to the bowl. One it's not sticking anymore, it's time to knead. Turn up speed to medium and knead dough for 5 minutes. I like to do this part by hand, instead. If that's what you want to do too, add a little flour to a clean counter and knead dough with the edge of your palms for about 6 minutes. The dough is ready when it's soft and slightly elastic. Place dough ball in a greased bowl and cover with a towel. Let it rise for 1 hour. It should be double in size. Punch down risen dough and remove from bowl. Place on clean counter with a little sprinkled flour. Cut dough into 3 even slices. Cut each slice into 4 even pieces. You should have 12 even pieces. Roll each piece into a ball, tucking under the edges to form a ball. Place all the ball into a greased 13 x 9 pan. Cover with a towel and let them rise again for 45 minutes. At the 30-minute mark, preheat oven to 375 degrees. Remove towel from rolls and bake in preheated oven for 13-15 minutes, or until deep brown on top. Remove from oven and immediately brush with melted salted butter. Serve warm with whipped pumpkin butter (see recipe below). Leftover rolls can be stored in a plastic storage bag for a couple days or frozen for a month or so. Rolls can be reheated in microwave for 30 seconds. Add softened salted butter to the bowl of a stand mixer and whip with a whisk attachment until light and fluffy (about 2 minutes). Add cinnamon, nutmeg, and 1 tablespoon of pumpkin puree and whip together until well combined. Continue beating the butter, while adding 1 tablespoon at a time until completely incorporated. It is very important to add only 1 tablespoon at a time so the moisture doesn't ruin the butter. Add honey and vanilla and mix until combined. Whip for about 2 minutes to make the butter light and fluffy again. Serve immediately or store for later. Note: the butter will harden again when chilled so let it sit out for 30 minutes before using. These look really delicious! I will have to try and make them at home and the butter too. So good! Thanks so much! I know you’re gonna love them! I’ve never tried making bread before as it always seemed so complicated but these look delicious so I may have to give it a try. You can totally do this. Sometimes I don’t see the worth in making bread from scratch because bakery bread tastes better. But not with these rolls! The best I’ve ever had! This looks amazing! I definitely need to make this. There is just nothing like a homemade roll! I had to stop making them because they’re so simple to make, and so bad for our waistlines! Lol. Yummy! So true! Moderation is definitely important! Omg!! These look and sound so delicious!! This is perfect for the holidays! I need to try this! These look absolutely amazing! It’s not a holiday without rolls, and these are it! And paired with the pumpkin butter, I could eat almost a loaf’s worth (bring back memories? Haha!) myself! Wonderful recipe! Oh my gosh, these look so indulgent ad delicious! What a great idea with the pumpkin butter. Yum! Thanks so much! I loooove that pumpkin butter, too! 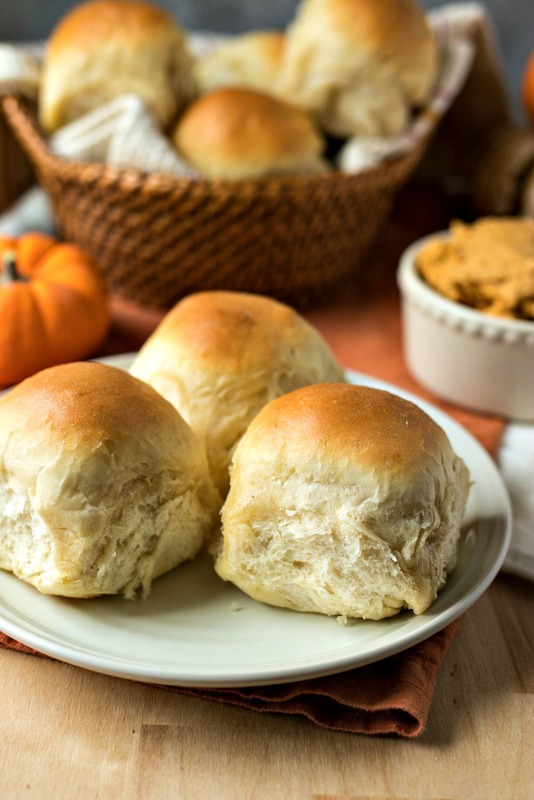 Not only do these rolls look amazing but whipped pumpkin butter? That sounds divine! These are my favorite type of rolls, but add in that butter and oh my! Yessss! That butter is everything! I’m obsessed with this recipe! My two favorite things, carbs and pumpkin! Right?! Cheese better watch its back…pumpkin is quickly becoming one of my 2 favorite things too, along with carbs! These look so amazing. I have always been afraid to tackle bread and rolls, something about the yeast terrifies me. But your recipe makes me want to overcome that fear. And that pumpkin butter…..to die for! Great post! Aw yay! You can do this! These look PERFECT! I’m obsessed with pumpkin spice, what a great recipe to add to thanksgiving. Thanks for sharing! There is nothing better than fresh baked rolls right out of the oven and yours look especially delicious! I can only imagine how the whipped pumpkin butter sends them over the top! I’m making this combination of Thanksgiving! Thank you. SO true! Warm bread is my weakness!